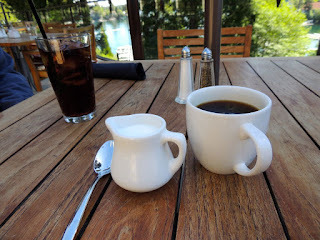 My husband and I spent a couple nights at the Lake Arrowhead Resort & Spa. Our room package included daily breakfast at the resort's restaurant, Bin 189. We also decided to try out their dinner menu our first night there. Here are my thoughts about dinner: Before deciding to eat there, we looked over the menu. The host and hostess were friendly and they commented about how much they like my camera and how impressive it looked. Then they led us to a table in the main dining room. On the way, we passed through the bar. It looked very cozy there with a fire blazing in the fireplace and cushy seating. There was also a television, but the volume was low, so it didn't feel like a sports bar. We were given a table one table away from the windows. At first I wondered why we weren't given the empty table available at the windows. It was a mid-week night, so the place wasn't very crowded. I think only three other tables were occupied when we arrived. Then I noticed that the empty table by the windows hadn't been cleared yet. It still had an empty bread basket and wine glasses that needed to be washed setting on it. The table wasn't cleared until around the time we paid our bill. Considering how empty the place was, you'd expect the service to be a little faster. Our waitress was immediately available to take our drink orders. We just went with water, although I looked over the wine list and noticed that they not only had prices for bottles and wine by the glass, but they also had a price for a 2.5 ounce "taste" for about $3-4. I thought that was kinda nice and different. We looked over the menu, and I found a couple things that looked good. In the end, I ordered the Pan Roasted Hawaiian Butterfish, and my husband, who was in the mood for steak, went with the 10 ounce New York Strip. 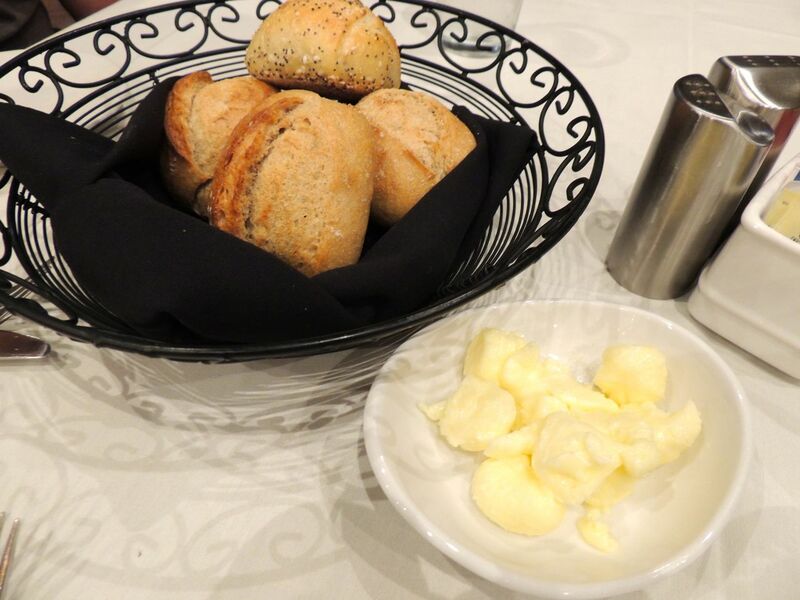 Our waitress told us that she'd be right back with some fresh bread. I'm guessing at least 10 minutes went by before she came back with the bread basket, and that was after reminding her about it. She said it was hot and had just come out of the oven. The bread basket consisted of 4 dinner rolls that were pretty hard on the outside. I understand crusty on the outside and soft on the inside, but this was more like tough on the outside and chewy on the inside. The flavor was okay, but it was really difficult to cut them open with a butter knife. There was quite a wait before our dinner arrived. We weren't in a hurry, so it wasn't a problem, but we did sit there for a long time. I wish I had timed it. It was long enough that we asked the waitress if the music could be turned up a little. We could hear that music was playing, but barely. The conversations at nearby tables were much easier to hear than the music. She said she asked the manager to turn it up, and it seemed like the music actually got softer. We mentioned it again, and this time she turned it up a little herself. That was better and added to the ambiance. It wasn't loud, you could just finally hear what was playing. Back to the food. I was surprised at the presentation. 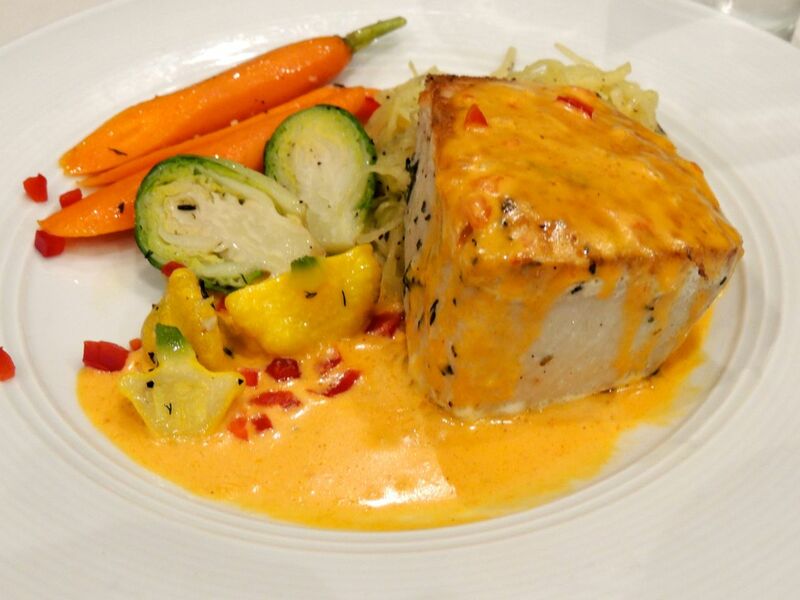 My dinner was described as "pan roasted Hawaiian Butterfish on a bed of spaghetti squash with a smoked red pepper beurre blanc and seasonal vegetables." Doesn't "bed of spaghetti squash" conjure up images of a large portion with the butterfish on top of the squash? Not the case. The butterfish was a nice size fillet, and the spaghetti squash was about the same size, not exactly qualifying as "a bed of." It was more like "accompanied by." The seasonal vegetable serving could've been bigger as well. As far as taste, the fish was like butter and if anything actually tasted better than the butterfish I had in Hawaii. I need to see if I can get this in L.A. somewhere. The spaghetti squash was crunchy. That surprised me. I expected it to be mushier like zucchini. I hadn't have spaghetti squash in years so I'm not sure if it's supposed to be crunchy or if it was just undercooked. The veggies were okay but I would've eaten more if more had been provided. The red pepper beurre blanc was amazing and added to the flavor of everything on the plate. I really enjoyed the meal, particularly the butterfish. My husband's meal was described as a "10oz. 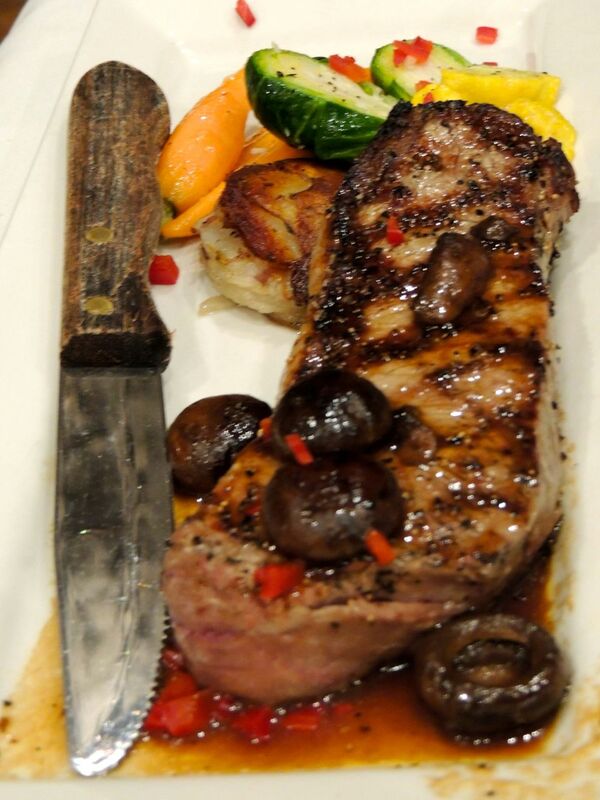 Prime New York grilled to perfection, with roasted champignons in a white wine and herb sauce served with scalloped Irish potatoes and seasonal vegetables." Once again, it would've been nice if the vegetable serving was larger. The potatoes were crisp and tasty. The steak, although ordered "medium" seemed more "medium-rare." It was bright pink all the way through. I tasted a bite, and it was chewy (kinda like the bread in the bread basket). There was also a ring of fat all the way around the steak. The meat and the fat were tough and chewy. It was definitely one of the worst steaks I've ever tasted as far as texture. I would've expected it to be so tender you could practically cut it with a fork. Outback's steaks are much more tender than this and for half the price. "Grilled to perfection" was NOT an accurate description. My husband has grilled steaks at our house that were tender, juicy and delicious. I'm glad I didn't order the steak. The flavor was good though. That was probably the herb sauce. For a somewhat high class restaurant, I expected a lot more from the steak...like, for it to be "grilled to perfection" as described. Since the portions weren't all that big, we were hungry enough for dessert. 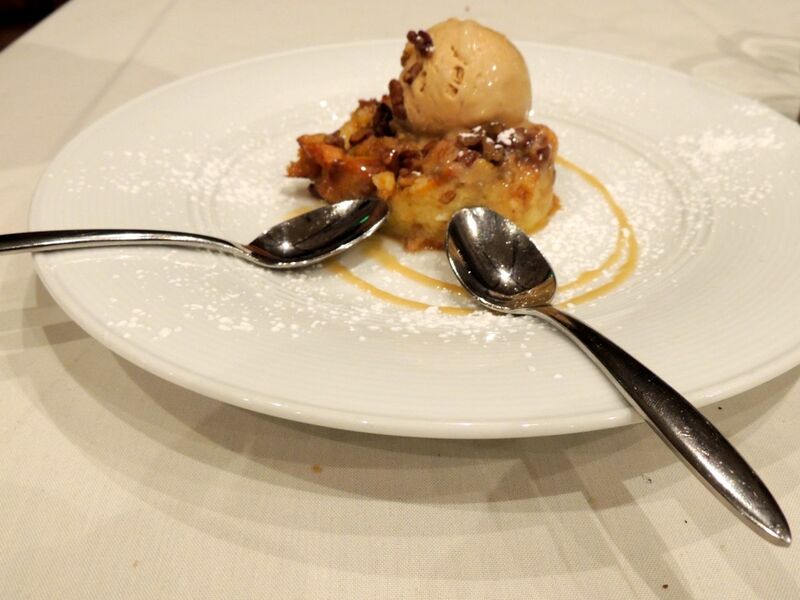 We decided to share the Chef Merlo's Cognac Bread Pudding. Once again, I was surprised at how small it was. They could've improved on the presentation by putting it on a smaller plate. It was described as "house made vanilla glazed donuts, fresh baked brioche bread and pecans baked to perfection. Served with a scoop of espresso ice cream and a warm cognac sauce." I really tasted the donuts and cognac sauce. It was good, but I probably wouldn't order it again. Summary on dinner: overpriced, overrated and very long wait for food. Perhaps the kitchen is understaffed and underexperienced in food preparation. Our waitress and the host and hostess were top notch however. On to my thoughts about breakfast. Since we stayed two nights, we had complimentary breakfast at Bin 189 on two mornings. The first day, we went down to the hostess stand where it said "please wait to be seated," but no one was there to seat us. We walked in to the bar area and looked around to try to find someone who worked there. After a few minutes, we saw a waiter deliver a plate of food to a table. He saw us waiting and came over to seat us. I think this place is understaffed. I later saw a hostess seating some other people, so I'm not sure if she just hadn't started work yet or was on break when we arrived or what. Also, the restaurant was almost empty, and the waiter told us we could sit anywhere we want. They might as well change their sign to "Please Seat Yourself." It'd make things more convenient for everyone. We chose a table by the window with a peak-a-boo view of the lake. Once again, the music was very soft, and we could easily overhear the conversations at other tables. The music should've been a little louder to cover conversations and so that you could at least hear what song was playing. We had a voucher that was good for 2 entrees and coffee, tea or juice. I ordered coffee. It was a little strong, but I drank it anyway. They brought out a little pitcher of creme. That's nice, but if you read my review about Belgian Waffle Works, you know that I prefer a variety of flavored creamers. My husband ordered tea. They brought out a cup, a little tea pot of hot water, and he had his choice of tea bags. He went with camomile. He steeped his tea bag in the hot water and then looked inside his cup. It was dirty. He asked for another one, which our waiter brought right out, but it really makes you wonder how clean anything is. Especially when there aren't that many customers, you'd think it'd be easy to keep things extra clean. We looked over the menu. I was torn between the Herb Egg White Omelet and the Arrowhead Omelet. I prefer egg whites, but the Arrowhead Omelet sounded better overall. I asked the waiter if I could get the Arrowhead Omelet with egg whites, and he said I could. 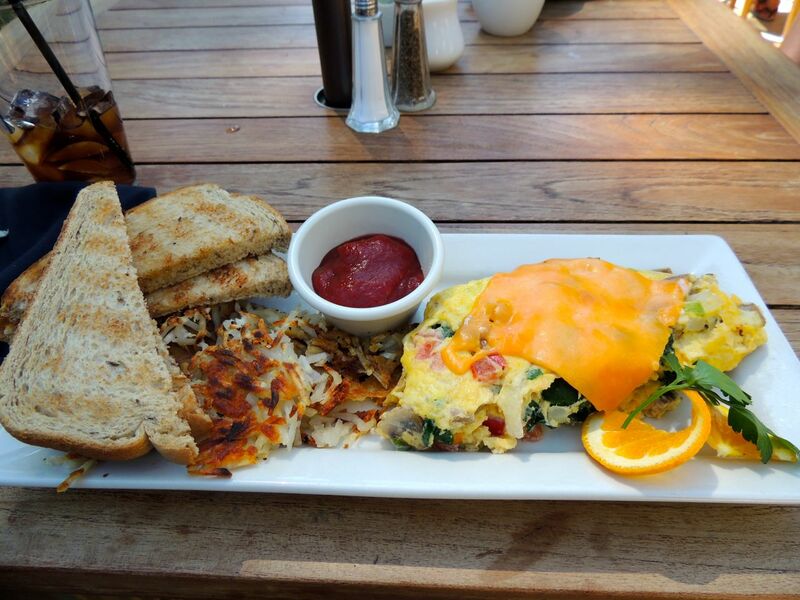 He said that it's not clear on the menu, but the Arrowhead Omelet is basically a build-your-own omelet. Perfect. I went with egg whites, ham, swiss and all the veggies they had listed (mushrooms, tomatoes, peppers, spinach, onions). It came with hash browns and choice of toast. They were out of wheat toast, so I went with rye. I was really impressed with the amount of food I was given. The toast was delicious. The hash browns were a little greasy (which is to be expected with hash browns), but they tasted really good. 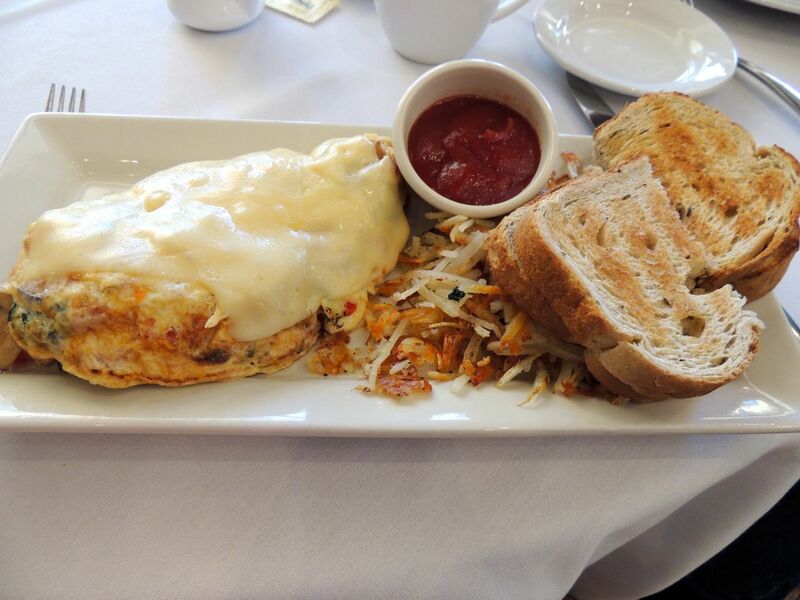 The omelet was huge. This was the first time that I had seen an omelet topped with cheese instead of having the cheese inside. It needed a little salt and pepper, but then it was perfectly tasty. I would get it again. 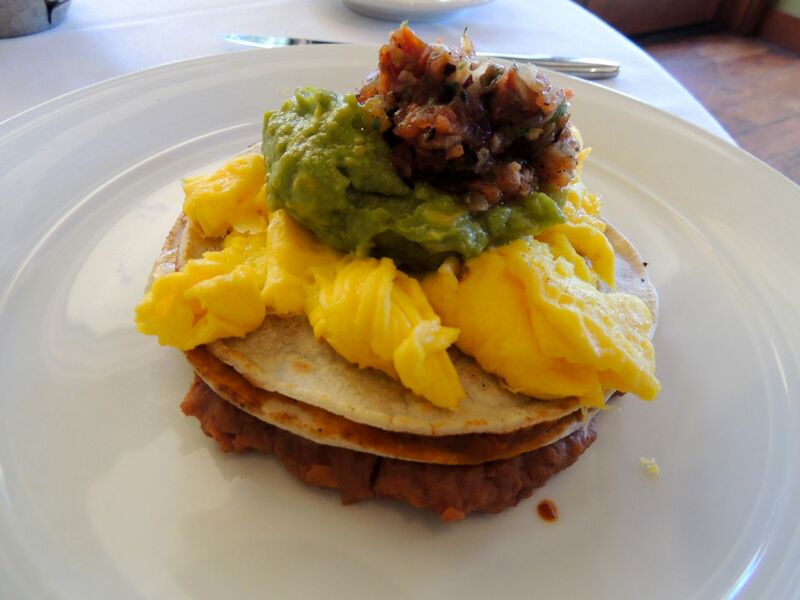 My husband ordered the Huevos Rancheros, which is described on the menu as "two eggs with refried beans, fresh cheese, salsa Serrano on a tortilla with sour cream and guacamole. His food looked a little lost on his plate. He somewhat jealously eyed my overflowing plate. His overall review of his meal was that it was "good. On a scale of 1 to 10 it was a 7." He thought it tasted about the same as what he could make himself. He's a pretty good cook, so that's not a bad thing. Overall, we liked breakfast better than dinner. Our meal was complimentary, but the prices on the menu weren't bad for what you get. Entrees were about $10-13. That's about a third of the prices on the dinner menu. We arrived at the end of breakfast, and when we were leaving, I saw lunch items being delivered to a nearby table, a salad and a burger. They looked adequate. Today we had another complimentary breakfast voucher. This time there was someone at the hostess stand when we arrived. She asked for our last name before seating us. I asked her if there was a wait, and she said "no." I'm not sure why she needed our name. We decided to sit outside this time. She let us pick our table. I ordered the Arrowhead Omelet again. This time I went with bacon instead of ham and wheat toast instead of rye. Everything else was the same. 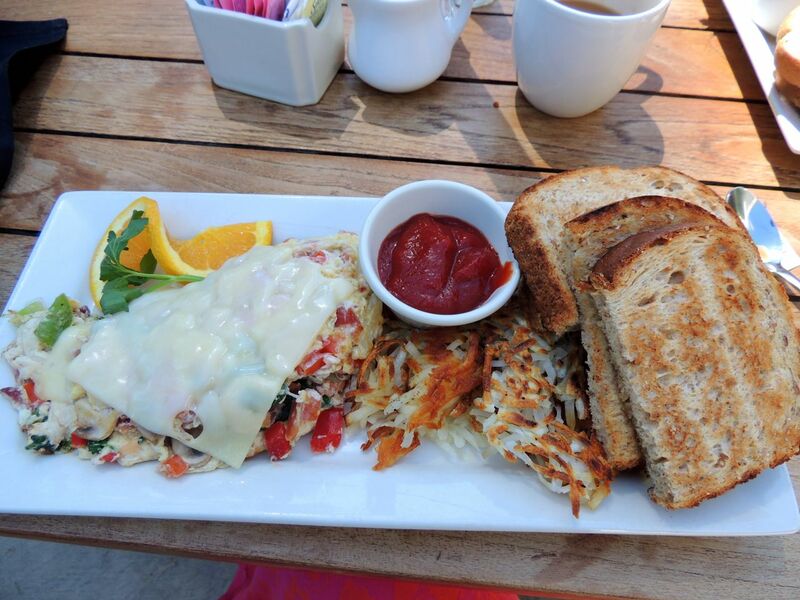 My food looked great at first, but then I noticed a hair on top of the Swiss cheese on my omelet. They sent it back and replaced it no problem, but it makes you wonder how sanitary anything is. I ordered coffee today, and the waitress brought out a spoon for me to stir it with, but she set it directly on the table. 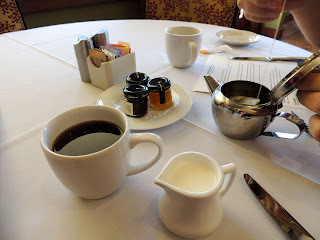 I tried to assume it was clean, but considering there was syrup on the table from previous guests, I'm sure they didn't actually wipe off the table. I'm not paranoid; I just hope I don't get sick. My husband was torn between ordering the Arrowhead Omelet or the Stuffed Ham and Cheese Waffle. 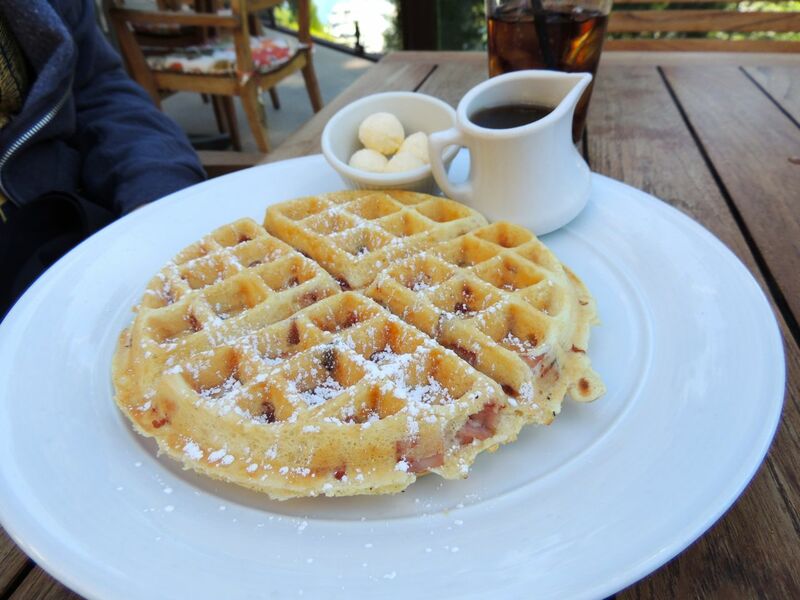 The waitress recommended that he try the waffle and said she'd get him something else if he didn't like it. He decided to try the waffle. We thought the wrong order arrived when they brought out his waffle. It just looked like a normal Belgian waffle. The ham and cheese was just mixed into the waffle batter. We had pictured something more Monte Cristoish with ham and cheese "stuffed" between waffles. He tasted it and said it tasted light and airy. It wasn't bad but it wasn't as described. As promised, the waitress let him order something else. 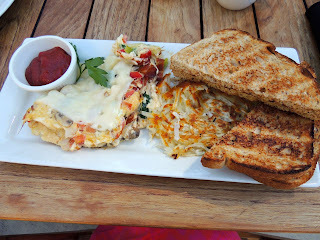 He went with the Arrowhead Omelet with cheddar, sausage and all the veggies with rye toast. The food was good, and the service was friendly, but I don't know that anything is really clean. If I weren't getting a free breakfast here, I'd go to Belgian Waffle Works for breakfast.